First, I want to say CONGRATULATIONS to Ashley who won last week's Jade Nefertiti Bracelet Giveaway! I just know you'll love it!! This week's giveaway is the Anna Fong Ribbon with Chain Necklace provided by Nicole of Shrink Boutique (love her!). 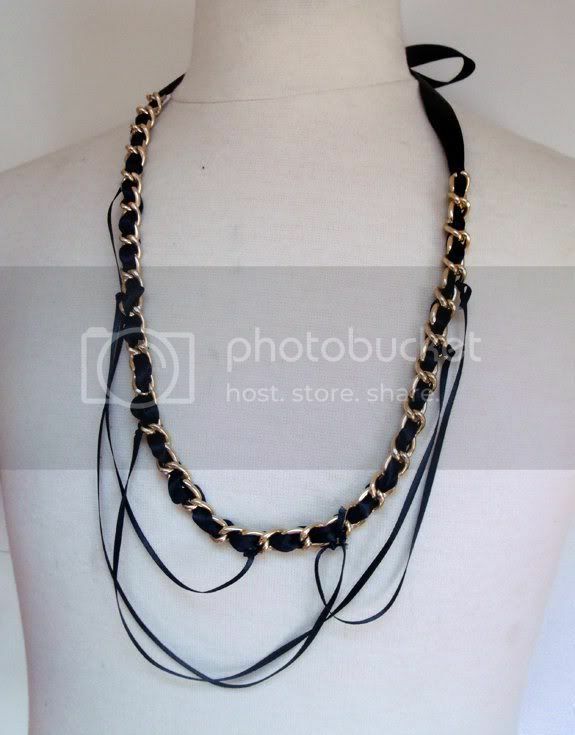 This necklace is the perfect blend of feminine (ribbon) and masculine (chain). 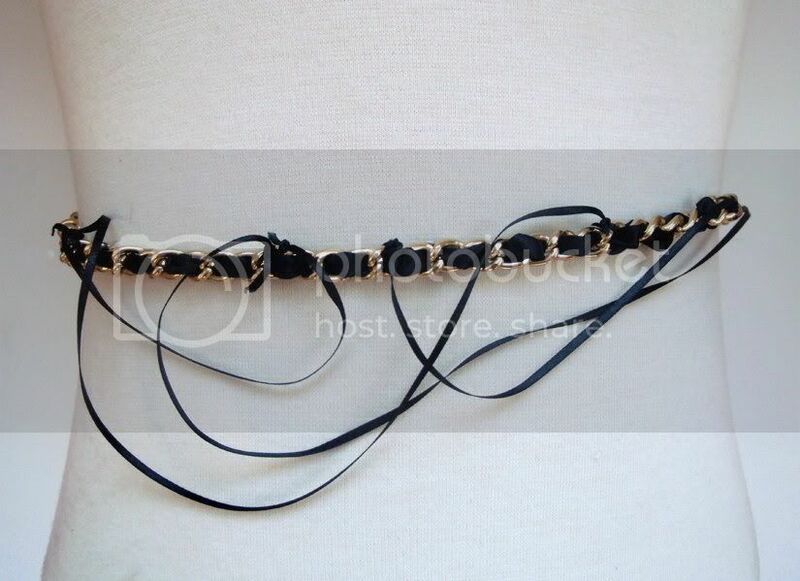 It can be worn long or short but also as a headband or belt. Anna Fong is a Chicago designer known for her fabulous accessories and clothing. Shrink Boutique is a Chicago-based online store that offers some of THE most unique and funky clothing/accessories around. Leave a comment indicating how you would rock it (necklace, belt or headband) AND what other accessories you would wear with it. I would love to see how YOU would accessorize an outfit that is centered around this necklace. * Include links to pictures of the accessories described (which can be either your own pictures or websites that display the items described). * Subscribe to ChiTown Fashionista. * Post a link to ChiTown Fashionista on your blog (please provide your blog's website address). This giveaway will be open until midnight CST on October 18th. One lucky winner will be chosen at random. Good Luck to all my fellow Fashionistas!! CONGRATULATIONS to our winner, Natasha! I LOVE this necklace. It's exactly what I've been looking for to wear out on the weekend with a solid top, dark jeans and boots. Would definitely try it as a belt as well! And I would have to wear gold studs or small gold earrings to make sure I don't overpower this accessory. This necklace is sooo fantastic! I would totally wear this to work, peeking out of one of my conservative suits to jazz it up and later on to date night with the hubs. I would definitely only wear small gold studs to let the neckace shine. I will rock it as a necklace with my stunning black leather suit. Here link to leather suit @ http://t0.gstatic.com/images?q=tbn:ZjRAMcLfsvdXLM:http://www.more.com/images/photo/image/13/43/photo/1343/original/p_100669435.jpg. This necklace is a must have item. Red elbow length cardigan, white long tank, black long skirt with red boots would make this fabulous necklace a knockout!!!!!!!!! Then of course I could still wear it as a belt. Celebrate With Me! Lunaversoul Bracelet GIVEAWAY! Shoes by Fossil - Can You Dig It? Great Bib Necklaces Under $50!